Loaded with vegetables and packed with savoury goodness, bacon-infused pilaf works well as a meal with soup or salad. It can also be served in smaller portions as a hearty side dish. Eggplant and bacon pair beautifully together, and the flavours of the dish are completed by the lemon, soy sauce, and shiitake mushrooms. Though I prefer the more delicate flavour of fresh mushrooms, I often end up using dried shiitake mushrooms because they keep well in the pantry and are relatively affordable. 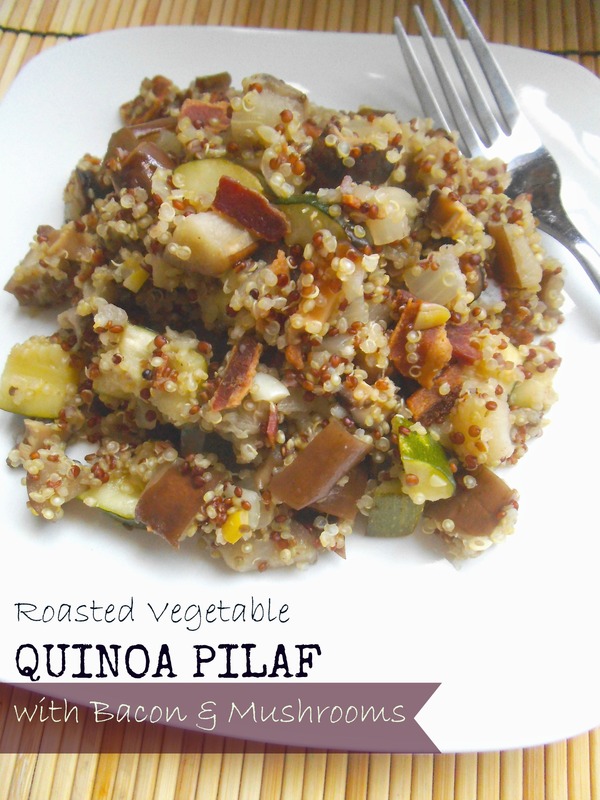 The next time I make this pilaf, I would like to try mixing some quinoa and Israeli couscous together. Though not gluten free, Israeli couscous would be a sensational base for the other ingredients. And whether it’s made with quinoa, couscous, or blend of the two, the rich, smoky flavours will keep me coming back to this simple, savoury pilaf again and again. Preheat oven to 400 degrees F (200 C). Slice eggplant and zucchini in half lengthwise. Combine minced garlic and 1 tablespoon olive oil and rub the blend over the cut surfaces of the vegetables. Place vegetables and bacon slices on a lightly oiled baking sheet or in a large shallow baking dish (lightly oiled). Roast vegetables and bacon until both are cooked through and bacon is crisp, about 13 to 15 minutes. Remove cooked vegetables and bacon from the oven and allow to cool to room temperature. If using dried mushrooms, rehydrate for 20 minutes in hot water. Meanwhile, saute onion for several minutes in remaining olive oil and then add 2 cups broth for quinoa (or 1 1/2 cups if making couscous) to boiling. Add quinoa and simmer over low heat for 15 minutes. Chop cooled vegetables, mushrooms, and crumbled bacon. 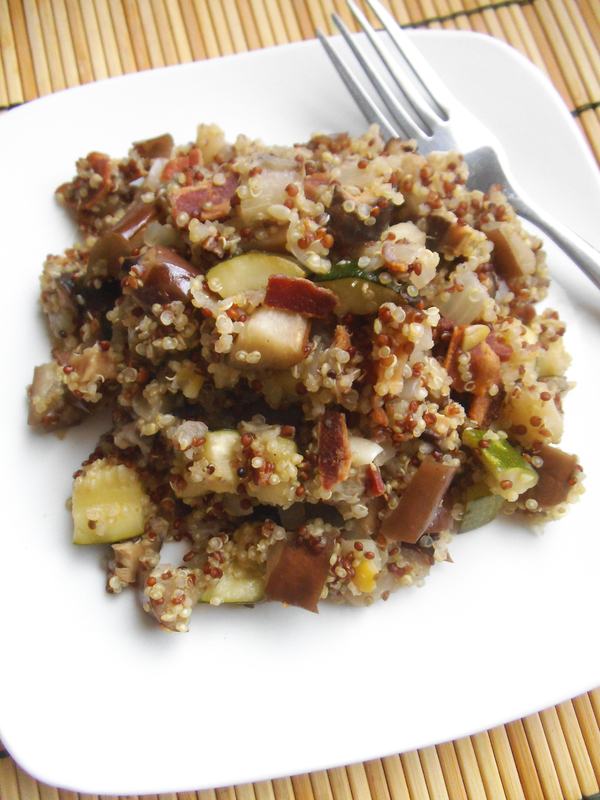 When quinoa is done cooking, add the remaining ingredients and gently heat through. Season with lemon juice, soy sauce, and salt to taste. Serve warm. I’ll be sharing this recipe here. I don’t know what it is.. but bacon and mushrooms make such a fabulous combination!! This looks wonderful!